How Often Do You Have to Have a Thatched Roof Rethatched? 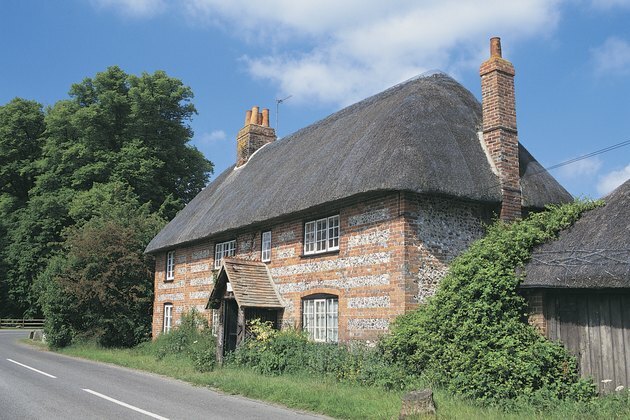 Thatch was among the first roofing materials. Grasses, limbs, leaves, reeds and even potato stems have been uncovered beneath thatch installations. If a roofing material is of vegetable origin, it is considered thatch. The longevity of a thatched roof depends on the type of thatch used, the pitch of the roof, the exposure of the roof to the sun, whether the roof is in a valley or on a hillside, and the environment. Thatching generally lasts from 20 to 60 years. Thatched roofing is sustainable and can last up to 60 years. Straw thatch is brittle and deteriorates at a greater rate than other thatch. Harvested with a binder and threshed, long straw must dry before being used. It is not necessary to remove the entire roof when rethatching, and instead, it can be installed piecework to replace aging long straw. The material is attached using hazel spars that are visible. Because birds feed on long straw, it is necessary to apply netting over the entire roof. Long straw thatching should last 20 to 30 years. Wheat reed, also known as wheat straw, is put through a combing machine to remove all the grain within the stalks before it is used as thatch. It can be applied over an existing thatch and when finished has a rounded appearance. The look is similar to that of water reed. The roof should last 30 to 40 years, with ridging replaced after about 10 years. The most waterproof of the thatches, water reed is applied starting at the eves and moving upward to the ridge. Because the reed is not as flexible as straw, ridges on these thatches are made from straw. The roof pitch for a water reed roof must be at least 45 degrees, as opposed to 50 degrees for other thatching materials. All old water reed thatching must be removed prior to rethatching. Water reed roofs should last 50 to 60 years. Indicators for rethatching include material slippage and exposed attaching materials that allow water seepage. Rainwater runoff creates channels in the thatch, which must be monitored for wear. These channels can be repaired. Birds, squirrels and even the wind affect thatch. Examine the roof frequently for damage. Accumulating moss does not mean a rethatch is in order. Moss provides a layer of protection for the thatch as well as creating anti-fungal protection. What Is the Minimum Pitch for a Tiled Roof?